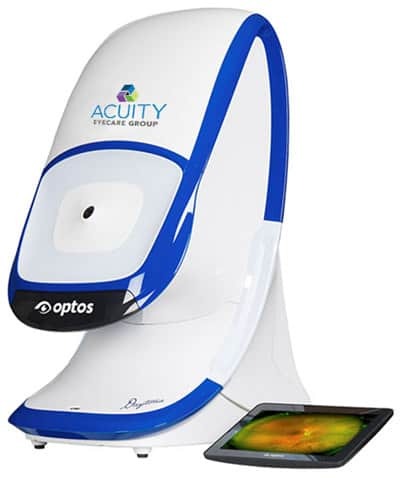 WHAT IS OPTOMAP ULTRA-WIDEFIELD RETINAL IMAGING? Did you know that many health-related issues can be discovered during a thorough eye exam that includes a screening of the retina? Early signs of diseases such as heart disease, hypertension, and diabetes can be detected by looking at the retina. The retina, which is located in the back of the eye is the only place that blood vessels can be directly seen. The Optomap ultra-widefield retinal image is a unique technology that captures more than 80% of your retina in one panoramic image while traditional imaging methods typically only show 15% of your retina at one time. The process is painless, quick, and you will not experience any discomfort. You will simply look into the special device one eye at a time and will see a small flash of light which signifies that an image has been taken of your retina. In most cases, dilation drops are not necessary but your eye doctor will make that decision upon administering the test. The entire process takes only a few seconds, and the images are available immediately. You will be able to see a picture of your retina in 3D, just as your eye doctor sees it. Efficiently and effectively detect early signs of retinal disease. Early detection of life-threatening diseases such as heart diseases, stroke, and cancer. Early protection from blindness or vision loss. There have been no reported adverse health effects in more than 50 million sessions. This is something that should be decided by you and your eye doctor. However, it is common to have an Optomap in conjunction with your annual eye exam. Yes. It is also recommended that children receive an annual eye exam as many vision problems begin at an early age.